Imagination Centre Scorpion Key Chain is an Orient Expedition Key Chain. Its release date is unknown. 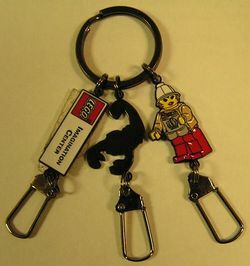 It includes a black scorpion attached to a key chain, the LEGO Imagination Center logo, and a print of Pippin Reed. Facts about "Imagination Centre Scorpion Key Chain"
This page was last edited on 12 January 2016, at 22:56.